&nbsp;A mineral-rich rock type called amphibolites gneiss underpins the peaks in the Amphibolites Mountains, yielding a more neutral soil than typically found in the mountains and feeding a rich diversity of plant life.&nbsp; The Amphibolites, which include Three Top Mountain, Elk Knob, Mount Jefferson, and Bluff Mountain, average about 5,000 feet, with 5,566-foot Snake Mountain reaching the highest elevation.&nbsp; The mountain range is oriented in a generally northeast to southwest direction and separates the north and south forks of the New River This 90,557-acre IBA is located in Ashe and Watauga Counties. Just driving in the area is a treat, as windy two-lane roads wander through scenic valleys with Christmas tree farms and rounded forested peaks.&nbsp; Over 90 percent of this IBA is privately owned. The site includes Mt. 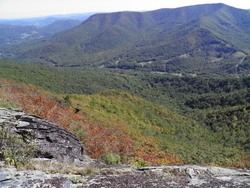 Jefferson State Natural Area, Elk Knob State Park, and tracts on Paddy and Bluff Mountains protected by The Nature Conservancy. The North Carolina Plant Conservation Network also has significant holdings in the range. The landscape is a mosaic of farmland and hardwood forest interspersed with creeks, bogs, spruce forest, and grassy balds at higher elevations.&nbsp; These diverse habitats are home to mammals such as black bear and bobcat and rare creatures such as the bog turtle and northern flying squirrel.&nbsp; Land use in the area is devoted to conservation, recreation, hunting, fishing, residential development, grazing, and Christmas tree production. The Bluff Mountain Nature Preserve is owned and managed by The Nature Conservancy. The preserve is accessible through a locally-based eco-tourist guide, Kim Hadley, who is the preserve&rsquo;s volunteer steward and has an intimate knowledge of the mountain. The cost is $10 per person. To make reservations, or if you have questions, please contact Hadley at bluffmountainpreserve@gmail.com or (336) 497-1972. The hike is approximately two miles over rocky terrain of medium difficulty and takes about four hours. Hours of operation and fees are subject to change.&nbsp; Contact directly for most current information. A1 Mountain Realty offers many options for you and your family. Our mountain property offers a variety of life styles to please everyone. Whether you&rsquo;re looking for a Ashe County family vacation home or a getaway from the hustle & bustle of city living you can find it here. From NC Mountain Luxury Homes to NC Mountain Log Home, large tracts of NC Mountain Land, NC Mountain Lots and everything in between. Let A1 Mountain Realty be your guide for all your buying or selling real estate needs. View all our listings from our website www.a1mountainrealty.com or do a MLS search for any type property in the High Country.